What do interior designers do to keep in touch with their customers? I decided to talk with one of my favorite people and friend Karla Shone, A.S.I.D. designer and showroom manager for EF Marburger Fine Flooring in Fishers, Indiana. I met Karla at a Mohawk University seminar I was conducting several years ago. I told her about our new magazine, Fabulous Floors and that we were looking for designers to feature. She asked if she might send me her recent home design to be considered for our first issue. The design was lovely and Karla became our first design story in Fabulous Floors Magazine. I have always admired her business savvy and her genuine concern for her customers and staff. I decided to interview her as she gets ready for one of her customer appreciation evenings, Girl Talk. Karla how did you get started in the design business? I studied design and have taken classes for over 20 years to get my A.S.I.D. designation. Design was my love even since I was a kid. My mom would come home and find that I had rearranged the furniture–again. Why do you feel it’s important to have the A.S.I.D. designation? A.S.I.D. is a very professional organization. Of course they are current on design trends but also provide educational information on running a design business and are concerned about sustainability. They set high standards for the design industry. Design fascinates me and I always loved architecture, furnishings, art and landscape design. I love improving a space and making it beautiful, comfortable and more enjoyable for my client. I was in the floral design business for many years but it got so big I found myself managing rather than doing what I really loved which was designing and working with people. During this time I met my finance Ron Marburger and eventually joined EF Marburger Fine Flooring. EF Marburger is a 4th generation business and been in existence since 1913 with a reputation for outstanding products and customer service at an affordable price. Because of their longevity in the community, clients expect us to be the best. The scope of a project usually starts with flooring, but includes cabinetry, counter tops, furniture, accessories, art, lighting—all designed to meet the client’s needs. I attend flooring and furniture markets to see the latest trends and take continuing education classes. My design ideas come from many sources including furniture and accessory manufactures such as Uttermost and Arteriors. I read trade magazines every morning to keep a step ahead on the latest offerings as well as keep a close eye on the fashion industry. Clothing colors and trends give you a heads up on what will be next in furniture and accessories. I’m a novice at the social media but I think it’s very exciting. It’s not just my younger customers engaged on line through Facebook and Twitter but anyone who is looking for information and wanting to connect. I’ve just set up my Facebook page for my business and am ready to start blogging. I’m excited that I did my first tweet last week! The key is keeping up with your customers and social media is another important marketing trend. It’s how everyone is getting information and it’s just something I have to learn and embrace if I’m truly going to give great customer service. I’m glad we have these new ways to connect with our customers and build relationships. The design industry is very competitive, how do you keep up with your clients? I think it’s very important to truly care about your clients. My goal is to let all of my clients know that I will be with them long after the job is done. I’ve read that 80% of a business’s new clients come from referrals so it’s important to let each of them know they’re special. Through designing a client’s home you really get to know them, their likes and dislikes. Design is very personal, no size fits all. How do you show your customers you love them? Customers need to know you really care about them. I work just as hard on a small project as I do a large one. Every client has different needs and I take time to personalize the experience of my clients. I would say that 90% of our business is word of mouth. When you’ve been in business as long as Marburgers you have to make sure every customer is happy. Networking in the community with our customer is another way to show them customers we care. How do you train your project managers? We are structured so that each project manager runs his own business within the umbrella of the corporation. Each run their project from start to finish handling everything from the first showroom visit to measuring, designing, pricing, preparing contracts, ordering materials, scheduling and overseeing the installation and completion of the project. At our weekly sales meetings we set goals, discuss strategies and ideas to improve our skills and maintain the ideals of the company. We also have weekly “lunch and learn” sessions where a manufacturer or distributor comes in and educates our staff about products. We do the same for our installers to keep them up-to-date with new and innovative installation products and techniques. What are the keys to good networking? The key to good networking is staying in touch with your customers and showing them they’re valued. It’s not about them knowing us, it’s about them knowing how important they are to us—and showing them our appreciation. We’re holding our first what I call “Girls Talk” at our store. It’s a combination of work and play and is for our designer community as well as our customers. We are presenting a program for designers on “Carpet for Acute Care.” The Carpet and Rug Institute offers this class for continuing education units (CEUs), and the class has been certified by the Interior Design Continuing Education Council (IDCEC). Along with this we are going to have some fun, jewelry, makeup and good food; things that women like. Of course it’s not just for women. Even though I’ve called it “Girls Talk” everyone is invited. We’re always trying to do events in our city. We’ve participated in U-3, a faith based networking group as well as partnering with the Chamber of Commerce. Kelly Novak, Ron’s Marburger’s daughter has been instrumental in setting up our networking events. We work hard and to be as active as possible in our community by supporting many foundations. The “Helping Her Heal Foundation” is a yearly Charity Polo Tournament to help raise money for women with gynecological cancers and “ Paws & Think,” a local animal rescue/adoption organization. We support St. Mary’s Child Center by attending several events each year to raise funds for underprivileged children who would not have an opportunity for preschool care and education. We are also active members of the Indiana Chamber of Commerce, the Indiana Builders Association, Angie’s List and the National Tile Council of America. Do you have any tips for people doing events and networking? For networking to succeed, it’s about the quality of the relationships you develop. It is important to stay connected with those you already know and continue to meet new people. As you meet a new person you should immediately think of people you already know that would be good for them to know and then connect them. This is how you build lasting relationships and form friendships that will benefit you in the long run. We try to stay connected with our existing customer and call every few months, do some direct mail and catch up with our old friends. Events can provide your company recognition in the community; get people talking about you (free advertising and show your customers appreciation. Of course you can take lots of pictures t o use on your website, post on Facebook and use for press releases. 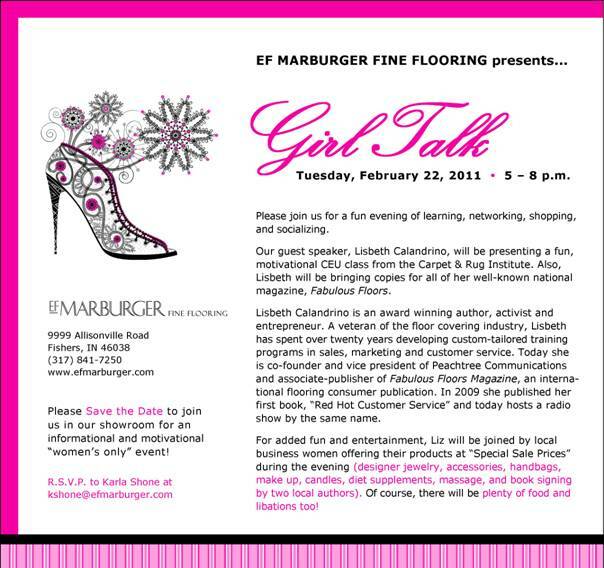 I hope you join Karla and myself at EF Marburger’s for Girl’s Talk on February 22, 2011.